A couple of weeks ago I popped into a beer store that I don't go to alot. 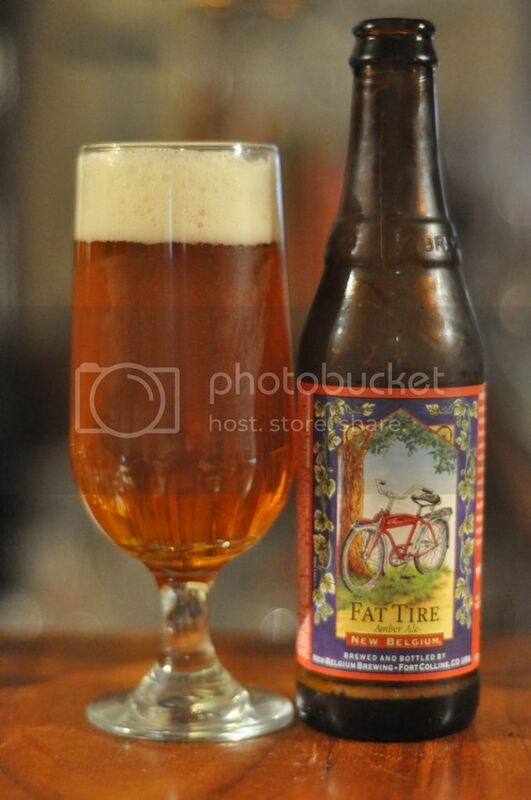 I was looking for one more beer to get a bigger discount and the American guy working at the shop recommended this, New Belgium's Fat Tire Amber Ale. It was sold to me as a, slightly upmarket, session beer. Apparently in some parts of the U.S. it's more common to drink amber ales than lagers as session beers, something I find something unusual. I can see it working though, a nice amber ale can be one of the easiest to drink styles on the market. It's been a really long day at work so hopefully it's alright. The nose is much more typical of an amber ale. It's full of sweet caramel malts and has a very biscuity nose. I also get a very creamy aroma which somewhat disturbingly reminds me of Kilkenny, certainly not my favourite beer. Theres only a tiny hint of hops as the beer warms and you really have to strain your senses to find it. They seem to be of a slight spicy variety. It's not a hugely appetising aroma but it's not bad either. For my liking this beer tastes just a little bland. It's really quite creamy with biscuit malts dominating the palate. There are some spices and hops present but even as the beer warms they still seem to be almost an after thought. I can taste a pear flavour as the beer warms which I'm not sure where comes from as the hops are slightly spicy but really not prominent enough for my liking. For me this beer is a little one-dimensional and boring. New Belgium Brewing Co. have produced a really nice amber ale, but I just don't think tonight was the night for me to enjoy it the most. I can appreciate that it's a nice amber ale but it just wasn't quite what I was looking for tonight. It's a beer that I will probably buy again to try it another time. Anyway as amber ales go it's a nice enough one, just a little bland. It's not the worst beer to throw in to your basket to get a discount, but nothing really special.